The hip transmits load between the upper body and lower limb, and can absorb up to 8 times the force of our bodies weight. Trochanteric bursitis The trochanteric bursa is a fluid filled sac which is situated over the outside aspect of the hip joints, between the hip and gluteal (buttock) muscle. This bursa allows the surrounding tissues to glide over one another with minimal amount of friction. If the bursa gets irritated and inflamed it is termed as a bursitis. The hip joints bursa is called a trochanteric bursa, therefore when inflamed it is referred to as trochanteric bursitis. Increased pressure on this bursa, usually due to tightening of the gluteal muscles and fascia or hip biomechanics can cause inflammation of this bursa. Pain over the prominent hip bone with or after walking, running, lying on either side or getting up after sitting. Referred pain along the side of the thigh into the knee. Acute bursitishis is common with a haematoma or ‘Roastie” from a fall onto the hip. Chronic Trochanteric bursitis is strongly associated with Gluteus Medius Tendonopathy. Management of these 2 conditions requires a specific treatment and rehabilitation approach. 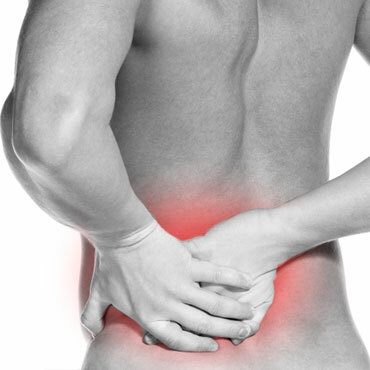 Labral tears can result from falls onto the hip or repetitive loading causing a tear over time. Osteoarthritis – the most common form of arthritis to affect the hips. This is degeneration of the joint cartilage with changes in the underlying bone. Bone fracture- fracture in the hip or pelvis. Causes may be due to a trauma or osteoporosis, due to the bone being brittle. Inflammatory arthritis – such as rheumatoid arthritis and ankylosing spondylitis. Congenital conditions – such as dysplasia of the hip. This is when the shape of the hip joint of a newborn baby causes it to dislocate or be prone to dislocation. Soft tissue pain- inflammation of tendon or muscle strain. Referral pain-Pain may be felt in the hip joint but, in fact, may be related to soft tissue structures around the hip such as muscles, tendons and bursae, or may be referred from a back problem.